The Liberty Pump SPAC-237 is an assembled sump pump kit that includes a Liberty 237 1/3HP sump pump and a molded pump platform to secure the pump and reduce jamming from debris. This Liberty sump pump kit is also equipped with two 4" inlet hubs with rubber grommet seals and can run up to 3450 RPM. The Liberty pump SPAC-237 can handle solids up to 3/8" and operates at 115V, 5.2 Amp and 60 Hz with maximum fluid temperature of 140F. 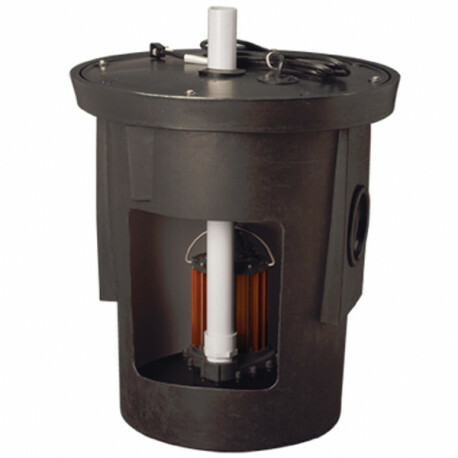 This assembled sump pump kit features an 18" x 22" polyethylene sump pit and cover with gasket and hardware, a pre-assembled 1-1/2" schedule 40 PVC discharge pipe and a molded pump support platform that raises the pump off the bottom of the pit.